Bangkok, Thailand -- To mark the centenary of Buddhadasa Bhikkhu's birth on May 27 - listed in the Unesco Calendar of Anniversaries of Great Personalities and Historic Events 2006 and 2007 - the government and various NGOs will hold activities including international seminars and translations of his books. The Culture Ministry and Foreign Affairs Ministry are to jointly organise an international event titled "Dialogue Among Civilisations" to promote living in harmony using Buddhist principles, deputy permanent secretary for culture Weera Rojanapoj said last week. Although final details have yet to be discussed, the date for the commemoration is likely to be either May 26 or 27 to coincide with Buddhadasa's birthday. The Culture Ministry plans to spend Bt1 million to publish and distribute 2,500 copies of a commemorative book detailing the activities held to mark the centenary this year and next, Weera said. Meanwhile, the Sathirakoses-Nagapradeepa Foundation is planning to mark the centenary with a range of international activities including the translation of "Dhammic Socialism" into 10 Asian languages and several Buddhism seminars in countries and territories including the United States, India and Taiwan, project co-ordinator Lapapan Supamanta said. From June 26-28, the foundation, in collaboration with Malaysia's International Movement for a Just World, will host a seminar called "Buddhist-Muslim Dialogue" at Suan Dusit Rajabhat University. A Buddhist leadership training camp will also be held from mid-May to June for 30 selected young social workers and students in Asia, Lapapan said. Workshops on applied religious rituals were also slated to promote modern-day religious practices, she said. The foundation, along with the Foundation for Children, is also hosting an essay contest for high-school students to write about Buddhism in their lives. Ending on March 31, five winners will each get Bt7,000 and a privileged "Buddhist Leader" card worth Bt20,000. On Saturday, the 2nd Suan Mokkh Seminar will be hosted by the Dhammakhosa Network at Thammasat University's Tha Prachan campus from 1pm to 5pm. 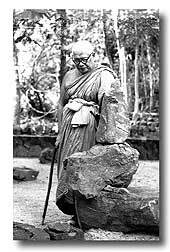 One of the world's outstanding Buddhism teachers, Buddhadasa wrote more than 140 books, a number of which were translated into other languages, especially English. "The Core of Buddhism", a collection of his lectures to doctors and medical students, won the Unesco Best Book Award in 1961. He died in 1993 after a series of heart attacks and strokes, at the age of 87.